...is exploring the streets of hamburg. hot venture ;) if street view were a start-up, it would be dead before it could really start. 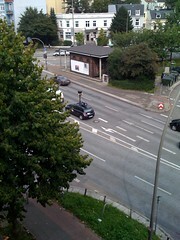 i can´t imagine, why german people are so averse to google´s street view. mr. idle likes it! "What are you trading?" is StockTwits asking you. Like twitter.com asks you "What are you doing?" I think there is nothing more to explain.. Follow CouchTycoon on StockTwits.com and learn more. But to be honest, I guess Mr. Idle wouldn´t do any micro investment on that start-up. Even the totspot.com start-up was founded in january this year, and they got press on TechCrunch twice, I found them yesterday. Weird, I know. I like the idea of blogging about my kid (if I had one). I´m just asking myself why noone seems to do that. There are several blogging tools and websites on the web that enable parents to "blog their kids" but noone does. Maybe parents do not trust in the web?! I´ve no clue. I love the idea and I´m sure if any startup of them which "bring your baby online" asked Mr. Idle about an investment he would do a micro investment at least. wow! when we found the post of the fring.com startup on TechCrunch, we were really happy. Finally we are able to twitter, skype and gtalk on our iPhones. And even more. Yes, you can also make normal VoIP (SIP) calls through your regular SIP provider like A1 (Austrian network operator), VoipBuster, etc. fring really helps the team on behalf of Mr. Idle to co-work with our international team members more effectively. If anyone of the fring.com startup asked Mr. Idle for an investment, he would have done it.